You Will Probably FAIL On This Program! Yes, that’s right if you think this program won’t work for you… you are probably right! Failure, desperation and pure frustration is what so many people get from following the latest fad diet, or training program. You’ll probably think that you’re just meant to be fat and miserable for the rest of your life. Harsh? You’ll Want To Hate Me! But come day 20 (the morning after, the night before) you’ll stand on those scales, look in the mirror, and take your final measures you’ll see why, and see that it has been all worth while. I’ve been criticized, shunned, hated and slammed by so many people in my industry for putting this information out there. You see the 19 Day Get Lean Project is a culmination of 10′s of thousands of dollars worth of education, 100′s of hours of study, and 1000′s of REAL LIFE applications of the principles, on my training clients and those Project members who’ve gone before you. You Want The Slow Way Right? Most are painfully slow, some are not particularly good for you… and a few are down-right dangerous. I’ve tried many of these methods (including some of the dangerous ones) and I am happy to report that the 19 day program presented here, will net you better results in 19 days than pretty much any other training program in twice that time… And I will guarantee that right now! You’ll also discover that my method should be called the “Get Healthy Project”, because a healthy body loses body fat, faster and maintains low levels of body fat better than any quick fix solution you might have come across before! My name is Paul Mort, and unlike most other fitness professionals who you’ll find all over the web, I am actually a former fat boy… that’s right I have not always been the perfect, pristine, cover-shot pose guy… To be honest… I am not really in to all that posing anyway… I am just an ordinary guy with a family who wants to have a better looking body. The guys and girls that join my training programs are everyday folk, just like you, wanting to pull on a clothing size or two smaller, want to have more confidence to rip off their shirt down the beach on their holidays and just feel happier with their body. They have jobs, they have family, they have ups and downs, they even like to let their hair down from time to time, don’t we all! What to place in your shopping basket, so you don’t get distracted in to buying stuff you don’t want or need. How to stay motivated to do everything every step of the way, because EVERYONE has down days when they want to quit, we show you how to minimize the risk of quitting another program! Printable, downloads so you can print off the days instructions to remind you what to do. I am simply going to give you a link. This will take you to a Facebook page that has all the before and after photos, the status updates and the facts and figures right from the typing fingers of those that have done the Get Lean Project before. Here’s the link, I strongly urge you to take a look now, then come back and get your Project started today! Step 1: Click the big button below to sign up for the 19 Day Get Lean Project… you’ll be taken to a special secure web page to take your investment. Step 2: Once you’ve completed that step you’ll see a registration page to create a unique login for this website. Step 3: Follow the preparation information, and once you’ve got all the stuff you need to get started we’ll kick you off on to Day 1 of the program. BUT The Cheapest Way To Lose Weight Once And For All! I’ll tell you now this is NOT the cheapest program on the web today… in fact it is likely to be one of the highest priced fat loss training and nutrition programs you can invest in right now. And honestly I am proud of that, because I want you to know and appreciate the investment you are making in your body is priceless. But at the same time this will probably be the cheapest weight loss program you’ll ever invest in! You’ll not be needing to join a gym, hire the services of a personal trainer, join a fitness bootcamp or anything like that. Personal Trainers are also expensive and most never guarantee your results either. If you were expecting a $19 e-book, or a badly pulled together set of videos and PDFs that we sell for $27 then you are in the wrong place. Leave this web site now. We’ve put together a program that delivers RESULTS! But to be honest you are still getting my expertise for a fraction of my old personal training rates. I didn’t even start the discussion with potential clients until they realised their investment for one on one coaching would start at £2,500. The point is if you make a commitment right now to FINISH the 19 days, I will back you EVERY step of the way. You see I don’t deal with whiners, tire-kickers, complainers, lookie loo’s, program hoppers, energy vampires or anyone who wastes my time in any way. The only way for me to weed out these people and for you to place a value on your health is to set the investment at a level that is congruent with my core values, and belief in the effectiveness of this program. If I eliminate you because of this, then so be it, we are just not meant to be. Please don’t think this guarantee is not genuine! I want you to clearly understand the terms of the guarantee with this program. If for absolutely ANY reason you feel this program has not delivered as promised, if you don’t like the sound of Paul’s voice, or it is absolutely not the very best program you’ve followed, then please contact [email protected] so we can service a full 100%, no quibble, no weasel refund to your account. With Absolutely ZERO risk on your part now fully explained, it leaves you just one thing to do. Your next logical step is to click the button below and we’ll process your registration right now, and you’ll get immediate access to the Preparation information in the next few moments. Right at the end of this page you’ll find some of the Frequently Asked Questions to do with GLP, make sure you check out them all to put your mind at ease. Warning! This Project Is Probably NOT For You! A body you hate seeing in the mirror, and that’s why you are reading this web page. If you trust your instincts that this is a good idea, and this time you can succeed, then you will not “dabble”, you’ll go at this program full force without any fear of failure and in 19 days you’ll love the body you see in the mirror a whole lot more than you do now. 1. Do I Need To Be Fit To Start? No. Whilst the routines are difficult, every exercise is easily adapted to suit your level of fitness. Paul is a master coach, training literally thousands of clients over the last 10 years, and has developed a series of programs that can challenge both the absolute beginner and the more experienced exerciser. 2. If I Don’t Like Training Can I Get A Refund? No. You can do ALL the exercises from the comfort of your own home with a simple set of adjustable dumbbells. We want you to get the best results possible with the minimum investment, so equipment requirements are kept to an absolute minimum, and gym memberships are just not necessary at all. 4. What About The Supplements? The supplements we recommend are purely optional, but we have found that those that get the suggest supplementation get far better results. The supplementation protocol is designed to help speed up the detox of your body, as well as add in extra nutrients that your body is missing from your existing diet. You’ll easily be able to offset the investment of the supplements by how much you’ll save by removing many of the toxic food habits in your diet. We’ve done what we can to source the best quality, but lowest price supplements, and made sure we only suggest those that net the biggest results. 5. What’s The Diet Like? Put simply, the challenge of the nutritional changes is dependent on how good your nutrition is right now. You’ll need to cut out many of your favorite foods for the 19 days… remember you are doing this for results, not necessarily pleasure! However we have added in a number of different food options to ensure you can find something you’ll like to eat. After 19 days you’ll love your body shape so much more you’ll not want to return to many of the habits that got you where you are now in the first place! 6. I Am On XYZ Medication/Have knee/back/elbow/wrist etc etc Problems will I Be Able To Do This Program? You take full responsibility for your own health, and you ultimately decide if this program is right for you or not! We would always strongly suggest that you consult with a relevant health practitioner before participating in any nutrition or exercise intervention. If you find you can’t do the program for any reason, our 60 day full refund policy is there to protect your investment. 7. What Happens After The 19 Days? Yes… we know all about the other programs you’ve probably tried or heard about that get awesome short term results but you go back to where you are in double quick time! The last thing we want with the 19 Day Get Lean Project is for this to happen. Everything you learn during the 19 days can be applied easily as a long term strategy to keep the fat off for ever. We’ll show you how during the program. We also have a follow on program if you want to continue getting fresh training routines and nutritional advice after your 19 day project has finished. 8. What Is Clickbank? And Is My Credit Card Information Safe. Clickbank is the largest online payment gateway for electronically delivered information and software, such as the 19 day GLP. We use them so that your payment details are secure. At no point do we hold any credit card information of our clients, this protects both you and I from any payment problems. As soon as you click the “Buy Now” button you’ll be transported to a secure page on the Clickbank website, where your payment details are taken. As soon as this has been confirmed, you’ll get linked directly back to this website where you’ll create an account on our private members area. Then you’ll have immediate access to all the preparation information. 9. How is the Project Delivered? As soon as your account is created we give you access to all the preparation information to give you time to get hold of the supplements and your dumbbells. Then approximately 5 days after you’ll get access to Day 1 information. 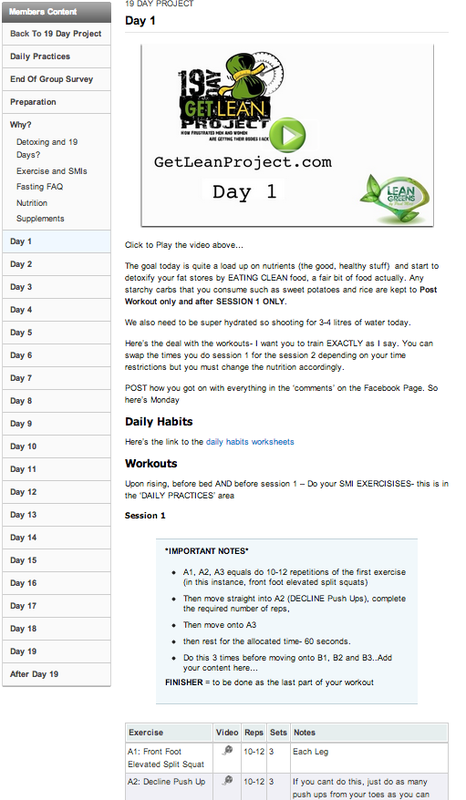 Each day contains a video explaining what to do, a written description of all the training, the nutrition process for the day, as well as downloadable documents. Each day after that you’ll get access to the next days information. You’ll also be reminded daily by email that the information for the next day is available. You’ll also find a video demonstrating every single exercise for every workout during the 19 days. 10. Can I get access to this program after the 19 Days? Every document and every video is available for download, so you’ll be able to keep all the information on your computer, and your login will remain active, should you need to access any information in the future. I must make you aware that the AVERAGE results are approximately ZERO… That’s right ZERO. We can do everything in our power to encourage you to complete the training program in FULL… and doing so will result in better results than any other training program you’ve followed in the same time frame. However many people simply sign up for these types of program expecting magic to occur and weight to fall off them with out needing any action. Don’t be that person. When you register for the 19 Day Get Lean Project, be the type of person that is not average, takes full 100% action and commits to the program IN FULL, and gets the spectacular results we often get on our program. We have documented the results of those that have completed our “end of program” survey, as well as got the before and after photos from many very happy clients. You can see all this information on the following page. I encourage you to check out the results for yourself. Contact Us – If you do have any further questions relating to the 19 Day Get Lean Project before you get started, drop us a quick email to [email protected] and we’ll do our best to give you a speedy response! Alternatively you can contact us via our facebook fan page too.